Texas World Speedway in September 2017. On Wednesday, a post popped up on a Facebook group for regional Porsche Club of America members saying Texas World Speedway, a near place of pilgrimage for amateur racers slated to become a neighborhood, wouldn’t be bulldozed for housing after all. The developer would not confirm or deny this to Jalopnik. 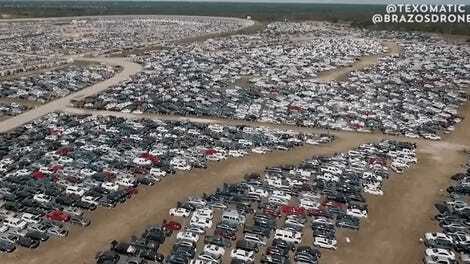 Texas World Speedway, a colossal two-mile superspeedway that once played host to the highest levels of American auto racing, started storing flood cars for Copart insurance auction after Hurricane Harvey in 2017. Not long after the hurricane, a former employee had also said that he’d lost his job there and all racing operations at the track had ceased. The thousands of flooded cars are no longer there, which is probably why this recent post from a Facebook user in the Porsche Club group gained so much attention. The track doesn’t look to be in as good of a state as it was before the flood cars got there, but seeing it empty aided the validity of what the post said—that “they are considering raising funds to recondition” and that the track would not become housing after all. The post has since been deleted. The person in charge of Texas World Speedway’s land, a real-estate developer named Bill Mather who, despite the neighborhood plans, races spec Miatas and seems to have a true passion for the events that go on there, told Jalopnik over the phone Thursday that the account that posted this on the Facebook group wasn’t authorized to say what it did. He also said, verbatim, that he would “neither confirm nor deny” to Jalopnik what was said in the Facebook post. Plans for housing at Texas World have been in the works for years, as major series left it behind in the late 1970s and early ‘80s and the college town it sits outside of, College Station, continues to expand outward as the local Texas A&M University grows. The plans for the new “Southern Pointe” neighborhood to replace Texas World are extensive, including nearly 2,000 lots for single-family homes, two commercial lots, an “urban lot,” a school, a proposed fire station and parkland on about 553 acres, as of city documents from December 2017. A person with knowledge on the neighborhood development said it’ll be done in phases, with the track torn out and the land leveled for homes, but guessed it’ll probably be 15 years before everything is done. Although the development land is outside of city limits, plans for the neighborhood are going through the city. The neighborhood plans have been pushed back several times now. 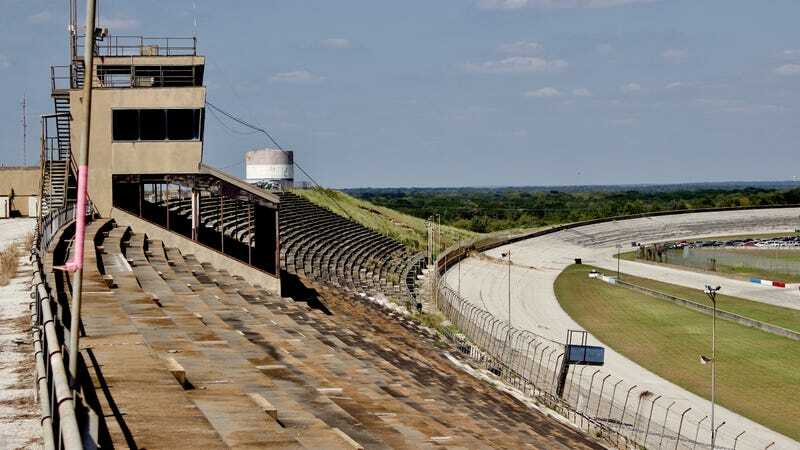 Major racing series left Texas World Speedway behind decades ago due to its location, facilities and limited accessibility from the narrow local highway leading to low attendance figures, and there are fears of deterioration under the banking of the 2-mile oval’s turns. The track’s interior road course was used for years by amateur series and track-day schools, until it suspended operations after Harvey to store flood cars for Copart auction. But the track has somehow survived all these years, despite everything. There’s no indication of how much time it has left, but as of right now, it’s still there—waiting for whatever may come next. Update: To better protect identities, we have replaced the original screenshot of the Facebook post with a quote of what it said. The screenshot included photos and a video still of a car on track.